The inaccessibility to the experimenter agent of the complete quantum state is well-known. However, decisive answers are still missing for the following question: What underpins and governs the physics of agent inaccessibility? Specifically, how does nature prevent the agent from accessing, predicting, and controlling, individual quantum measurement outcomes? The orthodox interpretation of quantum mechanics employs the metaphysical assumption of indeterminism—‘intrinsic randomness’—as an axiomatic, in-principle limit on agent–quantum access. 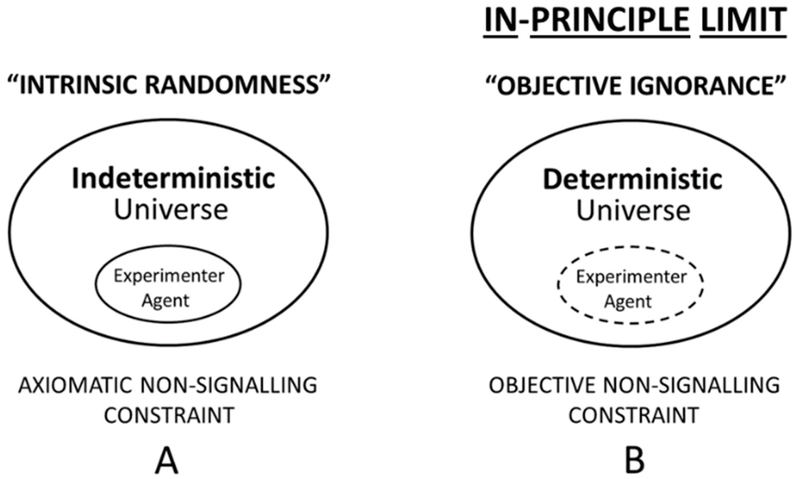 By contrast, ontological and deterministic interpretations of quantum mechanics typically adopt an operational, in-practice limit on agent access and knowledge—‘effective ignorance’. The present work considers a third option—‘objective ignorance’: an in-principle limit for ontological quantum mechanics based upon self-referential dynamics, including undecidable dynamics and dynamical chaos, employing uncomputability as a formal limit. Given a typical quantum random sequence, no formal proof is available for the truth of quantum indeterminism, whereas a formal proof for the uncomputability of the quantum random sequence—as a fundamental limit on agent access ensuring objective unpredictability—is a plausible option. This forms the basis of the present proposal for an agent-inaccessibility principle in quantum mechanics.